No matter what your background, this content-packed hour will change the way you THINK about speaking and publishing. Let's face it; many emerging speakers who haven't yet written a book to help them secure promotion and credentialing can't seem to earn a decent living. Maybe you're not even making enough as a speaker to work at it full time. Maybe you're working a "day job" to keep the income steady. It doesn't have to be that way. The simple truth is this: if you're really interested in speaking to larger audiences and generating significant speaking income, publishing a book is one of the fastest, most reliable ways to position yourself as an expert in your field, leading to more and better speaking opportunities and greatly enhanced media exposure. 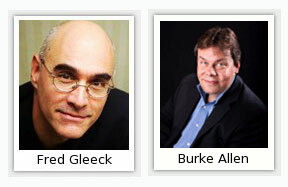 Tuesday May 3rd at 1pm ET during a very special GuestMatch radio teleseminar, GuestMatch Chief Media Strategist Burke Allen will quiz speaker, author and information marketing specialist Fred Gleeck on the link between speaking and writing, how to easily get your book published and then maximize your profits from it. This is a FREE teleseminar, presented as a service to GuestMatch and SpeakerMatch members, but attendance is limited to those who register in advance. Who Should Listen to this Teleseminar? Anyone who wants to massively increase their revenues as a speaker, author or publisher should attend this teleseminar. If you're an author, speaker, consultant or publisher, this event is tailor-made for you. No matter what your background, this content-packed hour will change the way you THINK about speaking and publishing. Who Should NOT Listen? If you're looking for the SAME OLD STUFF that is continually rehashed about speaking and writing, this teleseminar is NOT for you. If you're satisfied with the money you're making, this won't be your cup of tea. If you think you "know it all" take a pass on this teleseminar. If you want to catapult your speaking and/or writing career into the stratosphere with two experts who have developed techniques you won't hear anywhere else, this teleseminar is for you! How to create "hooks" for yourself and your business that will make you virtually irresistible to every media outlet and make coverage for yourself a virtual certainty. How to create promotional materials (media kits, etc.) that will have the media running to you for your opinion every time a story in your area pops up. How to promote yourself, your speaking and your books online, using low-cost means to increase your sales and exposure. How to quickly and easily create an automated process to capture leads and sales and up sell and cross-sell your customers with a minimum of effort. Fred Gleeck is an internationally known speaker, information marketing expert the author of fifteen books including: "Self Publishing for Maximum Profit," "Speaking for Millions," and "Marketing and Promoting Your Own Seminars and Workshops." He has given over 1400 paid speaking engagements in the last 25 years. Fred shows authors, speakers and consultants how to double or triple their incomes through the use of a time tested SYSTEM that he has perfected. This system will work with ANYONE in any field, and it will work for you. Burke Allen has placed author clients, both fiction and non-fiction, on dozens of leading media outlets including CNN, Fox, MSNBC, Good Morning America, The Today Show, The Rachel Ray Show, Sirius/XM, Mancow, Sean Hannity, Glenn Beck, The Washington Post, The New York Times, The Los Angeles Times, Yahoo News, The Huffington Post and more. Burke has a 30 year career in the working media, having been an on-air talent and programmer for leading broadcasters including CBS and AMFM, and is a current radio station owner along with heading one of the nations leading media, marketing and public relations firms Allen Media Strategies. Fred and Burke are serving on the faculty of this year's Publishing Seminar May 23rd in New York City along with best selling author and Oprah guest Bill O'Hanlon and self publishing expert Ron Pramschufer. The event is held in conjunction with Book Expo America, and more information is available at www.publishingseminar.com. Please note that the information that you will get on this May 3rd teleseminar from Fred and Burke will likely be very different than material you have learned previously.